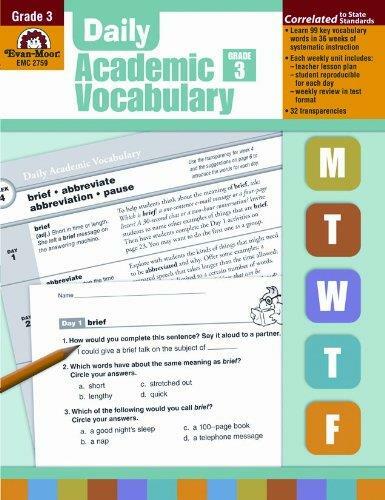 Daily Academic Vocabulary features: 36 weeks of systematic vocabulary instruction and direct instruction of key vocabulary words that students will encounter in many different academic contexts and learning experiences. Students will practice words through speaking, listening, reading, and writing. There is an easy-to-follow teacher page for each week with weekly reviews in test format and ready-to-use transparencies for introducing each weeks words. Each teacher page includes definitions and example sentences for the weeks words; instruction focuses on personal connections to the words. The student practice pages for Monday through Thursday include three or four daily items that focus on using the words in a scholastic or personal context. The student practice pages for Friday include four multiple-choice items that provide test prep; an open-ended writing activity requiring students to apply the words to personal experiences.